Finn Harps players, coaches and staff will work alongside 30 participating schools across the County on a comprehensive two year programme, where schoolchildren will enjoy a variety of sporting and community activities. 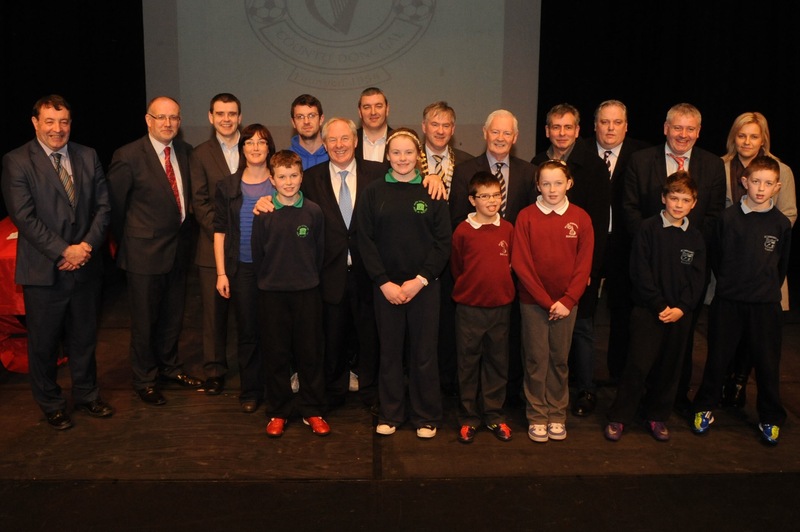 The launch was hosted by Finn Harps Secretary and Community Officer John Campbell and was attended by Minister for Sport and Tourism Mr Michael Ring TD, Minister of State for Gaelteacht affairs Mr Dinny McGinley TD, Donegal Mayor Cllr Noel McBride, Airtricity League Director Fran Gavin of the FAI and Finn Harps Chairman Joey O’Leary. Minister Ring also spoke of “the exciting sporting and economic opportunities” the new Stadium project will bring to the North West. Airtricity League Director Fran Gavin complimented John Campbell and Finn Harps on their dedication to working in partnership with Donegal Schools. “The FAI have been continually impressed with the range of community projects Finn Harps bring into Donegal, and we often cite Finn Harps as an example of what can be achieved when we are talking to other senior Clubs in the League,” he said. Mr Gavin also made himself very popular in the Balor with a “one for everyone in the audience” moment by inviting the attending Schools to be the FAI’s guests at the forthcoming Ireland v Czech Republic game in the Aviva Stadium! Project Manager for Finn Harps Schools programme John Campbell said “Finn Harps are delighted that we are working in these thirty schools throughout Donegal where in total 5294 children are registered. “All the Finn Harps personnel involved in the Project will be either qualified coaches or Harps Players from the first team Squad. We look forward to working with the Schools involved and we thank all the schools who applied to enter the programme. “We also are looking forward to working with Ulster Senior League, Donegal League and Inishowen League clubs in developing a strategy to bring expert coaching into Donegal Schools. It is an exciting project for us here at Finn Harps and all of us are looking forward to the challenge and opportunities that this programme presents,” he added. Donegal Mayor Cllr Noel McBride said: “I was very happy when I heard Finn Harps were launching this project because the club has shown they can use their profile to make a very positive contribution to public life in Donegal. “For example over the past couple of years I have been very impressed with how Finn Harps have worked with Donegal Road Safety, teachers, parents and school children to help increase awareness surrounding road safety issues within the County. I look forward to helping Finn Harps and the schools further develop the initiative in the near future,” he said. “I would like to congratulate Finn Harps on the launch of this exciting initiative which will support the tremendous work done by Teachers across the County.” Minister McGinley also expressed his delight that Finn Harps are introducing the programme through the medium of Irish to gaelteacht areas in Donegal. Finn Harps Chairman Joey O’Leary thanked those who attended and paid tribute to Club Volunteers and Players. Finn Harps thanked its project partners Donegal County Council, Donegal Road Safety, Donegal Sports partnership, Anti Racism Ireland, the FAI, the participating schools and junior clubs.